Earth energy. It can’t be seen or tasted and it doesn’t have an odor. But, the effects of Earth energy can be experienced in all of those ways. It isn’t loud, but it can be heard. It can’t be touched, but it can definitely be felt. Our ancestors knew that ley lines, earth grids and vortexes were energy sources and centers that were to be considered holy. They knew that Mother Earth supplied their physical needs, cured their ills and balanced their spirit. Mother Earth had also supplied the invisible forces of Earth energy. They respected the strength of these unseen powers and knew they were a place to heal physical, emotional and spiritual pain. Used as a place of communion with the Creator, our ancestors knew that these energy points uplifted the group or individual consciousness and fortified the soul. Today, in this fast-paced, technology-oriented, loud 21st Century, science refers to these sacred energy centers as geophysical anomalies. As an anomaly, science has the responsibility of attempting to define and label the physics of the energy centers. This has been attempted all around the globe by measuring magnetic fields and electrical impulses that may or may not be present in the area. More often than not, geophysicists and science in general have not been able to explain why things are the way they are. The scientific community, however, has been able to shed some light on ley lines, grids and vortexes, even if they do not fully understand why certain things happen. These scientific acknowledgments include: unexplainable biochemical changes that occur when a person is at one of these centers and the fact that the energy centers and paths are all heavily charged with negative ions, even in the most arid climate conditions. The oddity about using science and technology to determine what happens at these energy centers is that the technology to make this determination already exists within each and every individual. Every person relates and reacts differently to a different energy location and these personal reactions cannot be measured categorized by technology. In fact, to achieve the most accurate measurement we need to take a step backward and learn from our ancestors. The power and strength of a ley line, earth grid or vortex can only be determined on an individualistic basis by the physical body utilizing the spirit as the conductor and the mind as the translator. Rhythms of energy. All living things emit these unseen influences. We sense them intuitively and logically, even if we can’t see them. When a magnet attracts iron filings we can’t see the cause, but we can see the result and in turn know the energy exists. Earth is a living being and many of these invisible dynamics that the Earth emits interact between a human being and the planet. One such unseen force is ley lines. Sometimes called telluric pathways, ley lines are often not easily recognized. Some have compared ley lines to the acupuncture meridians of the human body. Certain points on the body are energy centers that transmit or receive strength to or from other locations. 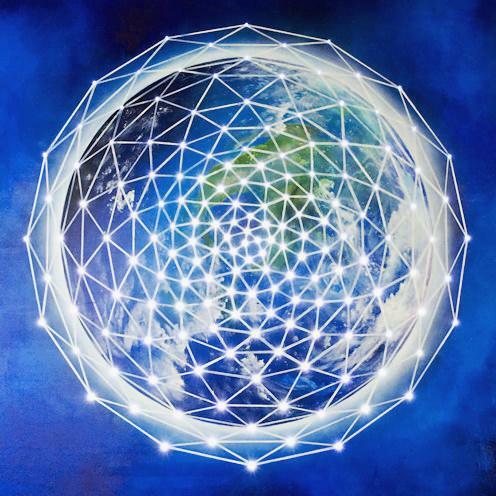 Ley lines transmit or receive energies around the globe. When these pathways were mapped in England at the beginning of the 21st Century they appeared to connect one holy shrine to another. The ancients of each civilization knew the paths of the ley lines and how to amplify the already abundant energy. Native cultures in the Americas called them the Spirit Path. The Chinese understood them to be a balance between the yin and the yang and the Aborigines of Australia called them Song Lines. Our ancestors often traveled the pathways in solitude, allowing communion between their physical, mental and spiritual being and the Divine. They knew that when these energies interacted with the body’s physical makeup the traveler often experienced a feeling of enhanced self awareness and a sense of centered spirituality. So it was on the Camino (A book by Shirley MacLaine). Vortex. The word brings to mind a spiraling energy, such as a tornado or water going down a drain. But vortex earth energy is very different because the energy of a vortex is multifaceted. An earth energy vortex can be electrical, magnetic, or electromagnetic. And even those terms are a bit misleading. A magnetic vortex doesn’t mean that the energy is literally a magnetic field, nor is an electrical vortex the carrier of electrical current. These names actually reflect the effect of the energy found at a specific vortex point. An electrical vortex is an energizing, activating location. A magnetic vortex attracts energy much as a magnet attracts iron filings. Electromagnetic vortexes combine the qualities of both types to provide an energy that attracts, activates and energizes. Even though a vortex is considered by science as a geophysical anomaly, indigenous peoples from all areas of the world, knew of vortex energy and revered these locations as sacred sites. The ancients knew how to work with a vortex to achieve a better understanding of self and of spirit. They also knew that vortex energy held the potential to help heal mind, body and spirit. Somewhere in our history we have set these old traditions aside, feeling that we no longer needed them. We were wrong. Now, many of us are trying to find and reawaken the communicative harmony that naturally exists between human, Earth energy and Creation. Vortex energy is only one of many Earth energy sources that may complete this trine. Great selection of a post, Shannon, as usual. We were talking pendulum stuff in a few emails last week (I haven’t yet checked out TAUK, though I went to the site); the guy I “learned” from is Sig Lonegren who has a master’s degree in Sacred sites – I think from a university in England. I lived in Santa Fe ’93 – ’97; it’s an energy vortex (news to me until after I got there), but it certainly explained why I ended up there and all that transpired while I was there. Shirley MacLaine lives there too as do many others like her spiritually (because it’s santa fe) and many others like her (actor/actress) in nearby Tesuque. There’s a very cool little general store/restaurant there that I think was also the post office. Fifteen years later, I hope it hasn’t changed. Famous people went (and likely still do, since they still live there) in and out of the general store all the time, along with residents and other non-famous people. “Negative energy is a ‘natural’ phenomenon. We need the natural negative energy to balance the positive. It is not usually harmful to people who live in these areas, although it is clearly dangerous in earthquake zones and areas such as Yellowstone Park. It is the negative energy caused by mankind polluting the atmosphere, particularly in cities which is harmful.